Over the years, Iago has earned himself a reputation in Venice as someone who tells the truth at all times, no matter the cost. This is hardly flattering, Venice is built upon deception and at most half-truths, but for Iago truthfulness has often been a godsend, getting him out of scrapes from childhood to his career in the military. His honesty also helped him woo his wife, his lovely and beloved Emilia. His reputation is most helpful, though, when Venice brings in a new man to head up the army, General Othello. Most leaders of the Venetian army – indeed, most soldiers – are not Venetian, but Othello, a man of African origin, is more foreign than most. He is referred to throughout Venice as Othello the Moor and seen as a sort of novelty. The elaborate and deceptive Venetian practices frustrate him, and Iago’s honesty is a welcome respite from the drudgeries of society. As such, he quickly promotes Iago to ensign and treats him more as a good friend than as a subordinate. Iago is a jealous man, however, and when Othello begins to show genuine interest in people other than Iago and Emilia, Iago begins to plot to return himself to what he sees as his rightful place in the general’s esteem. Othello is not one of the Shakespearean plays that I have read. I was aware of the Venetian setting, and the love affair between Othello and Desdemona, reviled by those around them at least partly for the elements of racial miscegenation. Of Iago, I knew only that he was the villain, not even what he had done to be considered such. It is always questionable whether classic retellings such as I, Iago will work well for readers who are less familiar with the source material, but Galland manages to create a story that stands well on its own, without prior knowledge of Othello being necessary. By virtue of being able to tell you how it holds up if you are less than familiar with Othello, I of course cannot accurately say how it stands up if you are familiar with the play, but it does seem that Galland has stuck closely enough to the sketches of the plot that I, Iago will succeed for those readers as well. There is a bit of a slow start to I, Iago. The first hundred or so pages are introducing you to Iago’s character throughout his childhood and early military career. They do give a very good shown-not-told foundation to who exactly Iago is and why he will later act the way he does, but there isn’t terribly much that happens, so they don’t move particularly quickly. Once Iago meets Emilia, and soon thereafter Othello, the story picks up to the point of becoming a page turner. 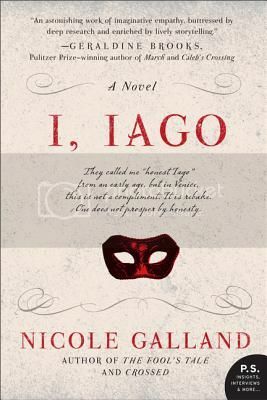 In I, Iago, Galland takes the reader into the psyche of a man who has been reviled for the past 400 years. You will likely still not agree with the actions he takes, but at least you will understand his motivations. Recommended. This sounds fascinating… I’ve always loved “parallel novels” that take the voice of a minor or muted character from one text and explore his or her (or its!) perspective. It gives you such a richer and more complex perspective on both the original, and the new! I’m a big Jane Eyre fan, so Wide Sargasso Sea is probably my favorite of these efforts, but The Red Tent, A Tempest (from Caliban’s perspective), Finn, and the Penelopiad are also fantastic. Thanks so much for this review! And I enjoy the comments – I’m newish to the blogosphere and it’s fun to be able to respond to commenters. FWIW, the second half of the novel doesn’t just stick closely to the sketch of the plot, it IS the plot – I wanted to see if I could, indeed, tell the actual story and make Iago human throughout. I suspected that was the case (re: the plot), but couldn’t say so definitively. You’re welcome! I saw Othello ages ago and know the story fairly well. I always thought Iago would be an interesting character to flesh out. I think I’m going to enjoy this one. I have this book to read (but haven’t yet) and was intrigued because of the mention of Othello in the description. Yours is the first review I’ve read Jen and I’m now more interested in reading this book than I was before…thank you! I just finished this book and loved it — way more than I anticipated. I found the background of Iago’s life and world to be the grounding I needed to care about him (and provide a realistic foundation for why he does what he does!). I, too, think it’s a solid standalone novel whether one is familiar with Othello or not — it reads like a great historical novel about a Venetian man trying to find his way in the world.